The snow fed crystal clear mighty Himalayan rivers flowing towards the Bay of Bengal are the most attractive and exciting destinations for river rafting in the various locations of this Himalayan kingdom. Karnali, Gandaki and Koshi are three major rivers in western, central and eastern Nepal, respectively. The tributaries of these rivers are flowing by making numerous rapids. So they are highly potential for river rafting. The Himalayan country of Nepal has varieties of white water choices, besides the Himalayan beautiful mountain ranges. 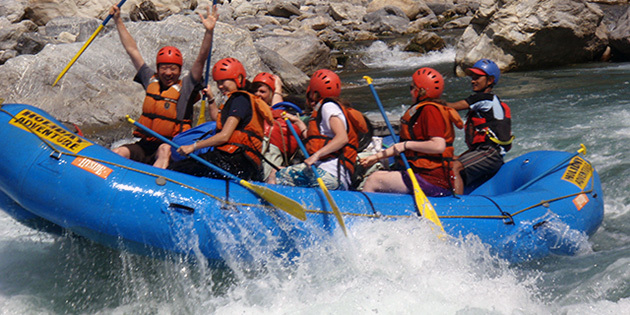 We - Holiday Adventure Nepal - have a series of world class white water river trips, which we operate on a regular basis. We aim to provide you the best possible rafting, kayaking & hydrospeed expedition at the best price. You enjoy the trips with self bailing rafts, light weight paddles, white water helmets, proper life jackets, roll top day bags for the personal gear, water proof camera barrel with 14 years of experience in operating rafting and kayaking expeditions on all Nepal's wild rivers. Our guides and trip leaders are all hand picked fully qualified, highly trained in rivers safety and has 100% safety record. Here are the some of the river trips that we operate on regular basis.